Da una piattaforma all’altra, per tendere faustianamente ad affinare e completare l’arte della comunicazione, per inseguirla costantemente. Ogni spazio ha i propri linguaggi ed ogni linguaggio permette l’espressione di un concetto, una sfumatura, una piega dell’anima diversi, che forse non esisterebbero nemmeno, se non esistessero i luoghi, le lingue ed i mezzi stessi attraverso i quali li esprimi. Ho deciso di aprire la pagina facebook di scrivoxvizio, per arricchirlo di voci e di angolature, anche se temo che ancor di più adesso prendiate il vizio, appunto, di commentare su fb, invece che sulle pagine del blog 😀 Ma certi rischi val la pena correrli, chissà cosa ne salterà fuori. Chissà cosa ci metteremo dentro. mi devo proprio scusare! Lo so che taccio da troppo, e vi ringrazio per le visite quotidiane e per la lettura dei post in archivio 🙂 ma in questo periodo sono… in altre faccende affaccendata! Ho un post proprio “qui”, che vorrei scrivere da giorni, ma non trovo il tempo materiale per dargli l’attenzione che merita. In realtà ne ho lasciati sfuggire più d’uno, spero di recuperarne almeno qualcuno, spero di potervi dire presto quello che mi frulla in testa, ma al momento sono le mie giornate a sembrare un po’ un frullato 🙂 Ceeeeerto, poi mi vedete su fb e pensate – ma se sta sempre attaccata allo schermo! Il fatto è che fb non necessita la stessa attenzione e costanza, si scrive come si mangiano le caramelle: sono lì nella ciotola, tu passi, allunghi la mano, ne prendi al volo una e te la gusti, mentre stai già facendo qualcos’altro… Un post è più come una buona zuppa calda, bisogna partire dagli ingredienti freschi – scelti, puliti e preparati a dovere – miscelarli nella giusta dose, cuocere lentamente e condire con estro, ma anche equilibrio 🙂 Ecco, è ricominciata la scuola, fuori una pupa, vado a vestire l’altra, poi altra giornatina bella intensa, di nuovo in macchina – viva la radio. 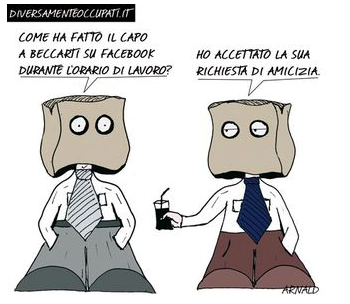 Intanto raccontatemi un po’ di voi: come lavorate? Come create? D’impulso o riflettendo? Succede più spesso che vi buttiate o che rimuginiate? E vi informate o per prendere fuoco vi basta una scintilla? Siete cambiati nel tempo? Siete più efficaci quando navigate a vista o quando la vostra direzione è chiara e determinata? La parola improvvisazione vi parla di freschezza ed autenticità o di impreparazione e dilettantismo? Siete più mangiatori di caramelle o creatori di zuppe? Io vado, il giorno chiama – ci sentiamo presto, presto presto, promesso. There’s a peculiar thing about facebook – well, more than one, but this specific one hit me the other day. We now regularly hook up with people we met or knew a long time ago, childhood friends that in time we grew apart from (some we outgrew, but being fb friends is still ok, not too invasive), people we dearly love but that live faraway, people with whom we crossed path, but who wouldn’t be in our daily sphere, but in thought, if it weren’t for the WWW and the social network vision of the world. Their lives are literally spread out in front of our eyes – and I don’t mean it negatively, but we have a sort of scrap album of everybody’s activities, more or less detailed, but always with at least a few pics, a suggestion to the composistion of their families, random messages to reveal and share moments of thier lives. While we are looking at the monitor we know that they are at the office, taking care of their families, or living some grand adventure. And that makes me think sometimes: oh, look at Christian, waking up everyday two steps from an oceanic beach; look at Claudia, living 10 months a year in a bikini; look at Sabrina, stepping onto the wooden planks of a capital’s stage; look at Martina, teaching at the university, in a language that isn’t even her native one, so capable, so professional; look at Simona, for whom celebrities are familiar faces and show business’ secrets a daily routine, and the Simona on the other side of the spectrum, who also lives in faraway countries, but decidedly less exotic, more dangerous and complex, but rich with the satisfaction of knowing that she truly is giving a helping hand to the less fortunate of this world. So sometimes it happens to me to think that, at some point of my life, I thought that would be my future, I hoped I could take that direction, I got close, then life turned out very differently. And sometimes I feel that I lacked something: had I been luckyer, more committed, more determinated, more disciplined, more adventurous, could I be “there” now? Would I enjoy it? Would I be any good at it? And the answers are multiple and the same: some things I could have done just as well, others I would have failed at, some could have made me happy, others would have been an escape. But these thoughts last less than the time it takes me to realise I have thought them. I have the life that I have chosen, more or less conciously, the life that Life worked out for me, with my complicity. My daily routines may look glamourous, or satisfying, or exceptional or heart warming to others: and if I step away and look at them, I look at me going through them, I can see the glamourous, satisfying, heartwarming side. And I see myself enjoying them fully, gratefully. We all are the sum of our potential, our chance and our choices: my sum turned out on the positive and very fortunate side of things. Yes, there’s more I can do, but I like that better than more that I could have done. Nothing is amiss, but there’s still space and time for dreams, projects, goals and surprises. I like the way my facebook pages are populated by interesting people: different, colourful, fun, professional, loving, odd… I like that my life is populated by them and I wish I could share more of my time with each of them, because people are the most surprising of all things crowding the planet. So I write a message, chat with one of them, take the phone and invite the other one over for the week-end – and let my life be touched, and stimulated, by theirs. So, thank you all. Because when I was working at TCBE in Brussels I could collaborate daily with my colleagues in London, Berlin, Copenhagen, Paris and especially NYC – and this made me feel my job was really cool (plus in the economic and financial realm I needed all the help I could get :-D). That was good both for my self-esteem and for my firm, because I really engaged in my activities and gave my best in a job I liked. Because when I moved back to Italy I was able keep easily in touch with my really cool colleagues from the Brussel‘s office, now spread a bit all over the planet. I still miss them a lot and it’s true that no virtual connection can make up for it, but thanks to Facebook and email we have organised to meet on February 12 and party as hard as we know we can!!! Because since I registered my Facebook account I found lots of people I hadn’t thought of for the best part of 2 decades and I found out that it wasn’t because they were forgettable people, but because I am so lucky to know more worthwhile people than I can keep count of. Because since I registered my Facebook account I discovered that there were way many more people in my hometown that remembered me than I ever thought possible. I therefore realised that my teenage insecurities were just that. In my late 20’s I was at ease with myself in relation to others, but I kind of realised that the others had always been. 🙂 This was a major turning point for me, I guess you can understand, if not relate. Because thanks to the net I ate a pretty nice carbonara last Thursday at lunch. It works like this: I have started a blog and my neighbour and friend Rossana is pretty annoyed with it, but she is a nice person and in spite of feeling she has lost me to the keyboards&screen she suggests the blog of another friend of her, which she thinks I’d like. So I go and check out Anna’s blog and I like it a whole lot indeed. So I comment on Anna’s posts and she visits my blog and comments on mine. So I befriend her on Facebook and she accepts. It just so happens that Thursday morning Anna posted on Facebook that she’d like to eat a carbonara for lunch. So I realise that I have a lone egg in the fridge and some pancetta (basically bacon – the one I have is not smoked), which isn’t guanciale, but for 2-year-old Marilù and myself it will abundantly do. So I cook up the pasta, fried the pancetta, whip pepper and parmesan into the raw egg, pour the mix onto the hot pasta, stir the fried pancetta in and voilà! So virtual my a**, it was pretty damn tasty. Because I have never felt this close to my cousin Paola since I befriended her and her smart, fun, lovely partner Giulia on Facebook, but especially since I started this blog. We were kind of apart in age, which counts more when you are kids, and then she moved to Sicily, so we never really had the opportunity to get to know one another as people, besides being family. And I find that we have more things in common than I considered, and I am pleased by it, as I always thought she was seriously hot :-). Now, there’s clearly still some way to go, as a “Like” here and there is just a start, but I think we are more likely to make an effort to get closer now than we were before. And I do think family is important. And I think it’s important to say it. Because a few days ago this really professional multi-blogger mcsixtyfive tweeted me that he loved my words – really, he wrote: I love your words. Now, as far as compliments go this one ranks about as high as when my friend and now landlord Giulio told me that I am the voice of his soul, as I read his writings. Or when Dennis Hopper said: “You look beautiful in that dress”, when I was working at the Brussels Film Festival and he saw me in my cherry red, long Chinese dress. He was actually walking away after we had a quick chat in the hotel’s lobby (yes, Dennis and I had “a chat”! :-)) and he purposely turned around just to hand me this completely unforgettable compliment, which I will forever cherish*. So, compliments really get you a long way with me and I hardly forget one. And to get one about my writing now is everything I can desire, or at least a fat slice of it.